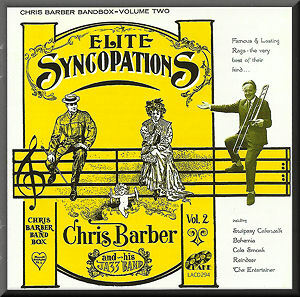 Visiting New Orleans in 1959, Chris Barber found some original ragtime sheet music that enabled him to record the 1960 LP Elite Syncopations, which consisted of the first ten tracks here. Paul Adams has added seven extra tracks recorded by the Barber band at various times between 1953 and 2001 (the last two being from the band when it was led by Ken Colyer). In fact Lake Records previously issued this album as a CD with four different extra tracks. The bonus tracks here are all previously unreleased. Most of Barber's reconstructions of ragtime are "authentic" in the way that Joshua Rifkin's recordings of Scott Joplin tunes tried to be faithful to the spirit of the original. But Elite Syncopations appeared ten years before Rifkin made his first Joplin recording, and 13 years before the film The Sting reminded millions of Scott Joplin's ragtime legacy, so you might say that Chris Barber was a trailblazer in rediscovering ragtime. I draw the comparison with Joshua Rifkin because his piano solos were considered rather prim - and so does the opening number here: Scott Joplin's Swipsey Cakewalk. It lacks some of the wild abandon one might expect from ragtime - and which can be found in several other tracks on the CD. The band seems to loosen up for Bohemia Rag, the first of three tunes where Barber's trombone was multi-tracked: an unusual device in trad music of the time. It works well in all three examples (the others being Cole Smoak and Reindeer Ragtime Two Step) because it creates the effect of a whole trombone section. Cole Smoak is also noteworthy for a heartfelt solo from Barber, with plenty of feeling. Most of the tracks on the original LP were by the important composers during ragtime's first flowering. Yes, The Entertainer is here: the Joplin tune that got Marvin Hamlisch into the British pop charts in 1974 on the basis of his arrangement of it in The Sting. The band gives it a respectful performance in Barber's arrangement. Several tracks are originals written by Chris Barber but they maintain the ragtime flavour and traditions - such as including two different themes and stressing syncopation. Chris's Merrydown Rag is the only track on the CD featuring the crystal-clear clarinet of Ian Wheeler. Of the other "new" tracks, Whistling Rufus was a staple in the Barber band's repertoire - understandably popular for its catchy tune. It was actually composed in 1899, the same year that Joplin published his Original Rags. Maple Leaf Rag is probably the best-known of all Joplin's pieces: it is included here from a 1998 concert recording. The last two tracks, by the band under Ken Colyer's leadership in 1953, sound rather strait-laced in comparison with some of the Barber band tracks. For example, its version of Harlem Rag seems a bit less relaced than the Braber band version from 2001, But it is all good stuff, reminding us that Chris Barber was an enthusiastic pioneer in so many ways.